Recognition of the university in the European and world educational space, active partnership and entry into the international educational and scientific organizations is a strategic objective of the University. restoration work and the creation of new centers of education, science and culture of the partner countries of LTSNU with educational and cultural mission as well as to increase the contingent of foreign students. The international service provided by the Center for International and Educative Work operates at the university to promote international cooperation. The Center helps the research and teaching staff and the university administration to improve skills by coordinating international educational contacts with relevant institutions abroad. In addition, the Center provides the implementation of scientific and methodological support and execution of appropriate documentation, as well as working with foreign citizens – students of LNU in accordance with normative legal acts of Ukraine governing the provision of educational services to foreigners and providing the conditions for their stay in Ukraine. Considering the issues of international cooperation of LNU, it should be noted that according to the results of scientific cooperation with the university of Switzerland in 2015 the university received a grant from the Research Foundation of Switzerland to organize and conduct the course “Certification of Distance Learning Teachers e-Tutor» jointly with “KROK” University (Kyiv), Zurich University of Applied Sciences (Switzerland) and Ankara University. During October – December 2015 sixty representatives of the teaching staff of LNU were trained according to the program developed by the Zurich University. At the end of the program, participants received international certificates, which correspond to the certificate of completion of training courses, which should be held once in 5 years. In October 2015, the Information and Resource Center “Window on America” was launched at LTSNU with the support of the US Embassy in Ukraine. The Grant on the opening of the center is planned to renovate the audience, the installation of technical equipment and furniture, purchase of methodical, reference books, CD’s and DVD’s in English (about 1,000 units). Every week free classes in English are held by the Center coordinator. Here is free access to online libraries at universities in the US (E-Library USA). In December 2015, LTSNU and the United States Agency for International Development (USAID) signed a grant agreement “Resumption of Training Assistance to the Displaced University”. Within the project the university received assistance in the form of two servers, computer and office equipment. Thanks to the cooperation with the Embassy of South Korea in December 2015, the university received help to ensure quality of the educational process in the form of computer and office equipment, two digital cameras, server equipment, special equipment for the studio and special air conditioner for server technology. Improvement of material and technical base allowed to improve the work of all departments of the University and to expand opportunities for the educational process. In 2016 the university received a grant from the British Council in Ukraine for the Project Research Capacity Building: A case study of Displaced University jointly with Cambridge (United Kingdom) within the framework of Higher Education Internationalization. In summer of 2016, there will be held the first stage of implementation of the project in the form of five master-classes for teachers of LTSNU and other displaced Ukrainian universities on topics related to the development of research capacity in Ukrainian educational institutions. On March 2, 2016, the Resource Center for Sustainable Local Development was opened at Luhansk Taras Shevchenko National University with the support of the project. During the last two years thanking to the signing of contracts with the University of Lodz (Poland), the University College of Tourism and Ecology in Sucha-Beskidzka (Malopolska, Poland), Ivane Javakhishvili Tbilisi State University (Tbilisi, Georgia) students of LTSNU were able to get a parallel education in a foreign university. During 2014 – 2016, twenty students of LTSNU study free at the University of Lodz. 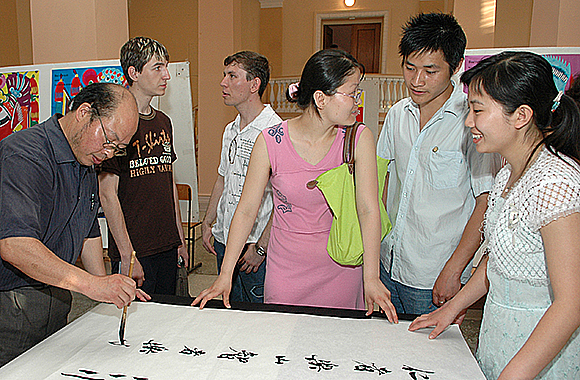 Within the exchange program the same number of students study in Chinese universities. Today the university administration of LTSNU is negotiating with the University of Almeria (Spain), the University of Nicosia (Cyprus), University of Huaihua (Hunan, China) about signing the cooperation agreements.